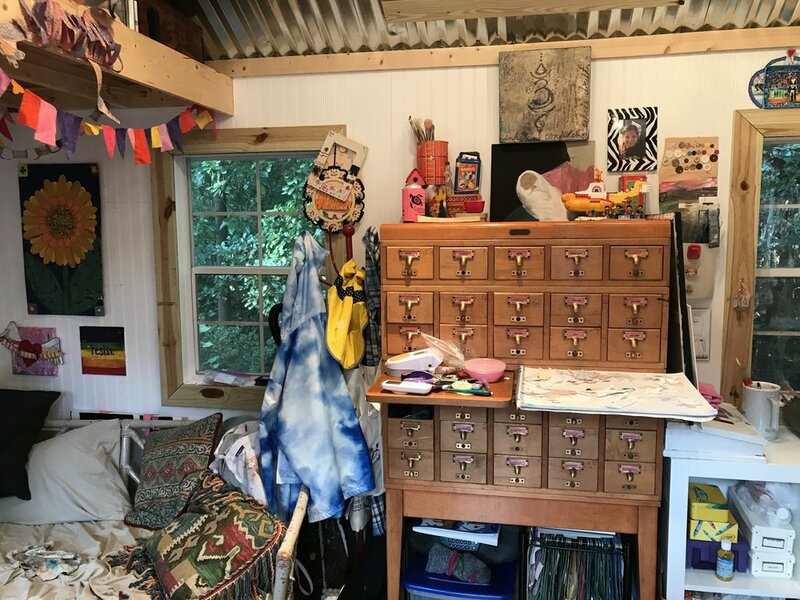 I have wanted to post this post for a long time as I often get questions about my studio. After returning home from my mother-in-law’s yesterday, I decided to clean, purge and do a little re-organizing, so now’s the time to show some pictures as it’s as clean as it’s going to get. The pictures will be from left to right as you enter the space. When you open the door, this is what you see. My beloved card catalog and then all. of. the. stuff. Emily’s desk. Prior to cleaning up this whole thing was covered in a giant layer of glue. She likes to make slime, what can I say? This little corner is where I take naps. I’ve had this little loveseat for years and I refuse to give it up. 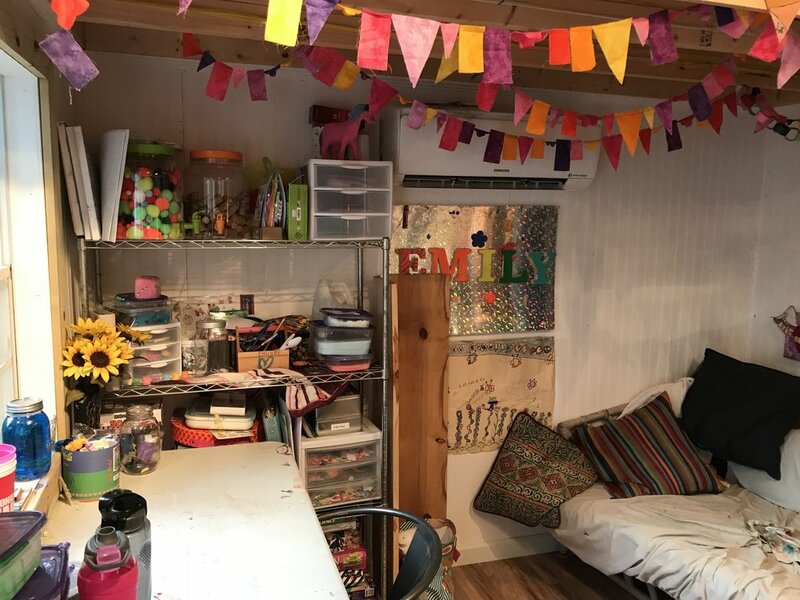 The flags are from my niece’s 16th birthday party (which was almost 10 years ago) and all of that stuff above is fabric and sewing related materials. The pictures over the loveseat: the flower was the 4th thing I painted in college. The collage heart was a 4-year-in-the-making piece, and the resist rainbow encaustic was something I made right after the 2016 election. Just to the right of my loveseat is my coat rack. I swear I feel like Mr. Rogers on most days, especially in the fall and winter. I come in and immediately take my shoes off. If it’s cold, I’ll put on a pair of socks (which you’ll find tucked below the card catalog) and a flannel shirt that’s hanging on the rack. I also put on my art apron. As I leave the space, all of this comes off, and my shoes go back on. It’s my thing - don’t ask why. Also hanging is the kid and the dog’s rain jacket. Because I have an 11-year-old. It makes me laugh. On top of the catalog there are two pieces of art that I love. The first is one my sister painted for me. It’s a likeness of the first picture that I have of me holding Emily. Every time I look at it, it takes me right back to that day. The second one is right above it and it was done by the talented Jessie Elson. She and I had been following each other on instagram, but we met at an art show in 2017. In a brief conversation, we discovered that we are both walking similar paths right now - pursuing our art and being all in after major life events caused us to evaluate what we were doing and what really made us happy. I love her style, it’s so different than mine but a lot of our themes are similar. The piece reads Inhale Confidence, Exhale Doubt. It’s perfect. To the right of the catalog, I’ve stacked a few canvas works in progress. This one on the front was something I started 2 years ago and found it sandwiched in-between a bunch of random sketches. I should finish this one. The box that they are sitting on is a gift from my brother. He made the box when he was in boy scouts. He painted it and gave it to me as a Christmas present probably 10 or so years later. My brother was always great at giving homemade gifts to us. I cherish them now more than ever. This shelf holds my ridiculous collection of paints, crayons, pens, markers and pencils - THREE cubbies worth! I could teach a kindergarten class! It’s also home to my books, magazines and random gessos, mediums, glues and stuff. This little flower girl is an example of the work I used to make oh so many years ago. I need to re-glue her top petal, but other than that - she’s held up really well for almost 18 years. Rounding the corner now, this is the most beat up area of my studio. My originals and works-in-progress were starting to get out of control, so I am using basket and a file organizer to see if it helps. I often cut up small illustrations to scan, and so the bottom of the basket now holds all of those pieces while the file organizer has the larger images. I also reorganized my paints. 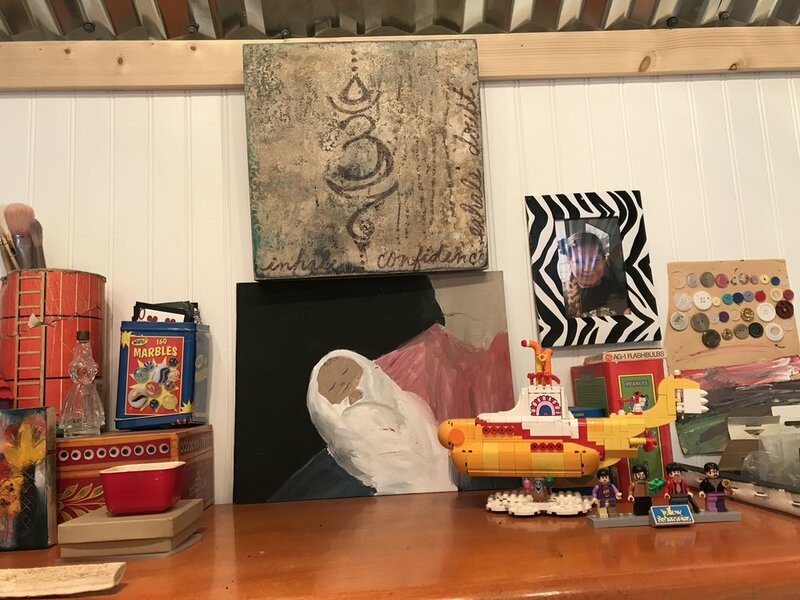 My acrylics have always lived in the painted basket that my niece/her mom gave to me so many years ago. But now my watercolors and gouache paints all live in the little white box next to the basket. Finding a place for the paints has been my biggest challenge in this space. This is probably the 4th time I’ve tried to re-home them, so we will see if this approach works. I have also put all of my sketch, watercolor, tissue and random other paper together in the bottom cubby. Before, they were scattered in 3 different places so this seems to make sense. This little corner of my desk holds all of my essentials - brushes, water, black ink pens, copic markers, scissors, rulers and erasers. The little green bowl was my only successful attempt at making something on a pottery wheel. It holds my glasses, erasers, pencil sharpeners and werther’s originals. My Bob Ross bobblehead is one of my favorite toys. He has an easel where I can switch out his paintings in miniature. When I’m feeling sassy, I turn on my marquee M. The quote above my supply box is one of my favorites.